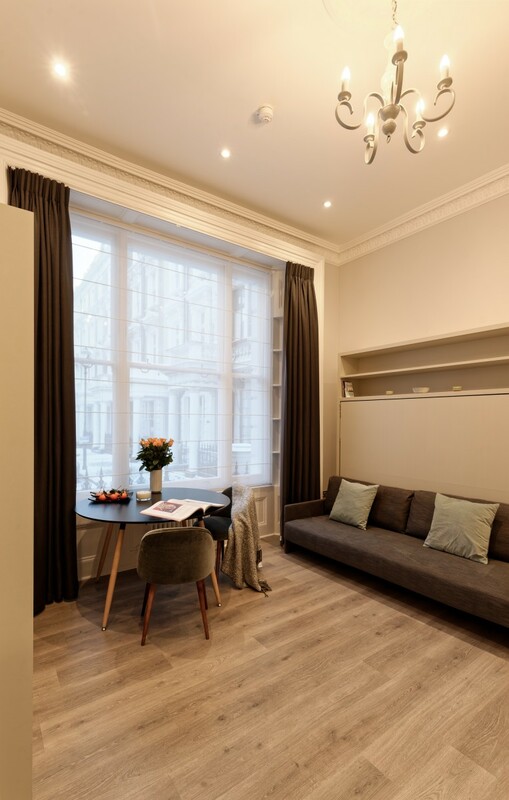 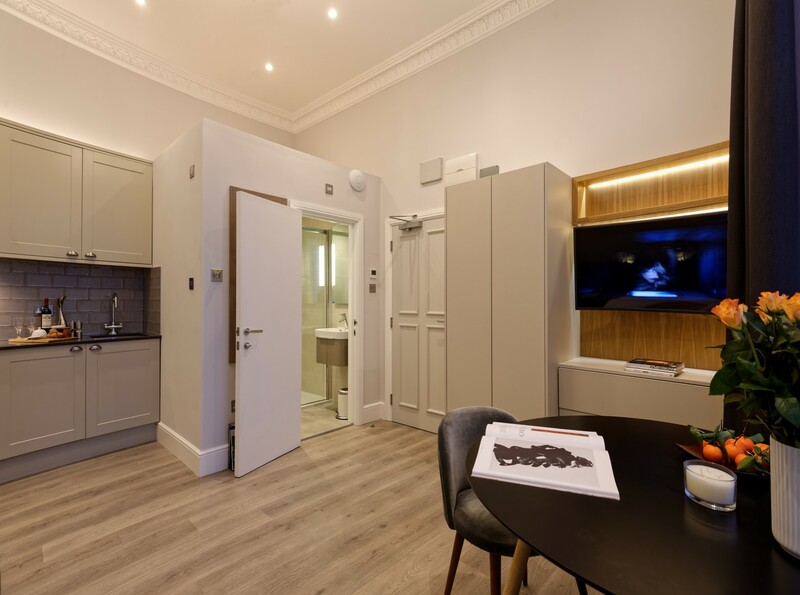 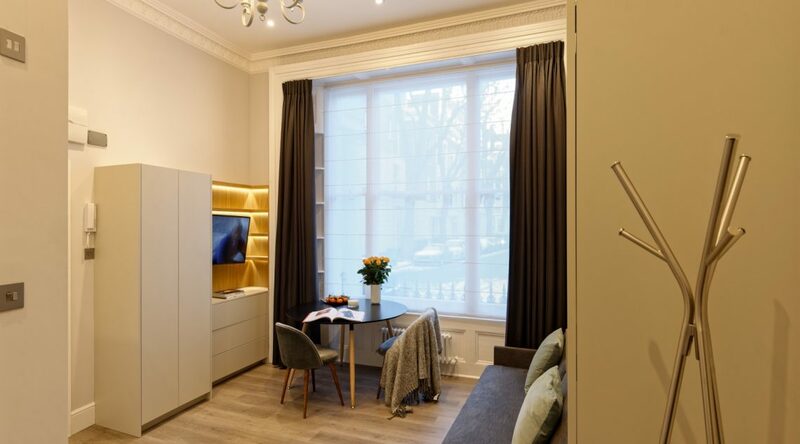 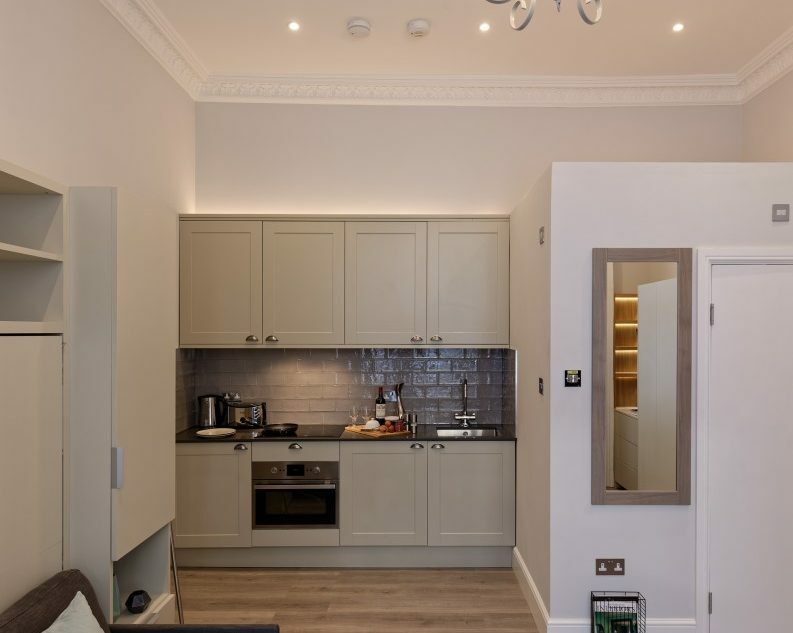 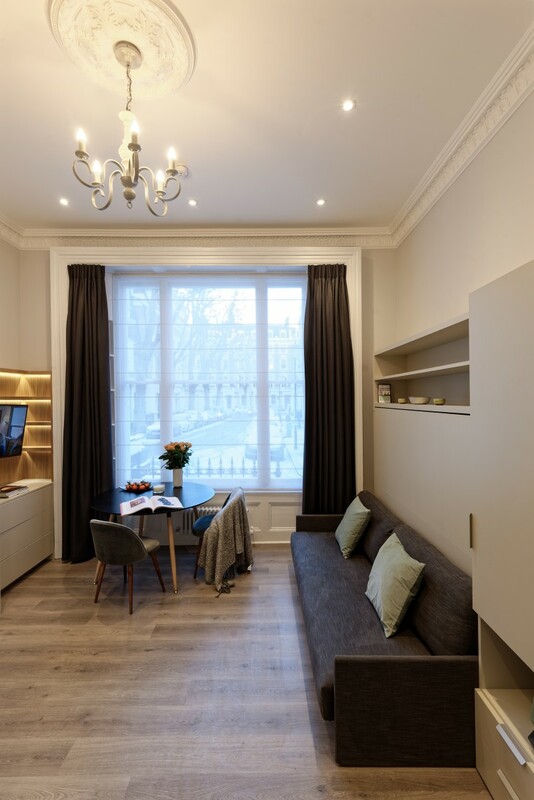 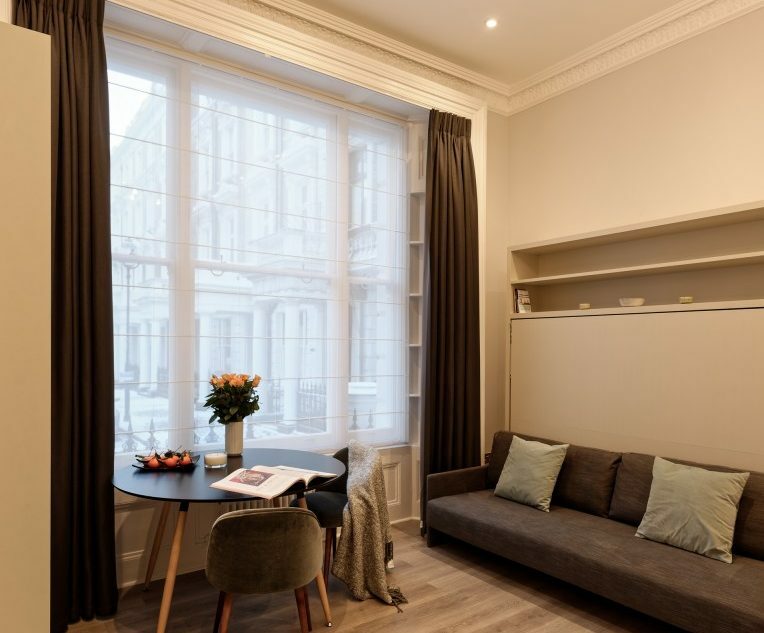 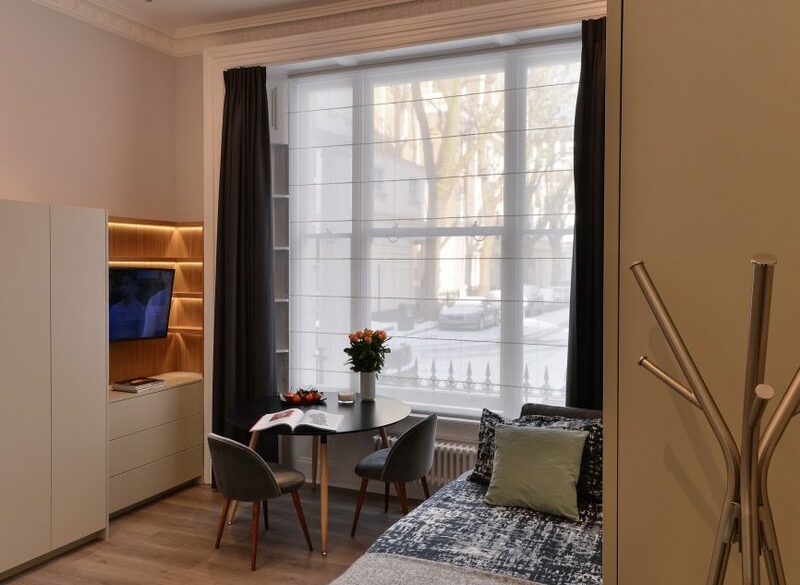 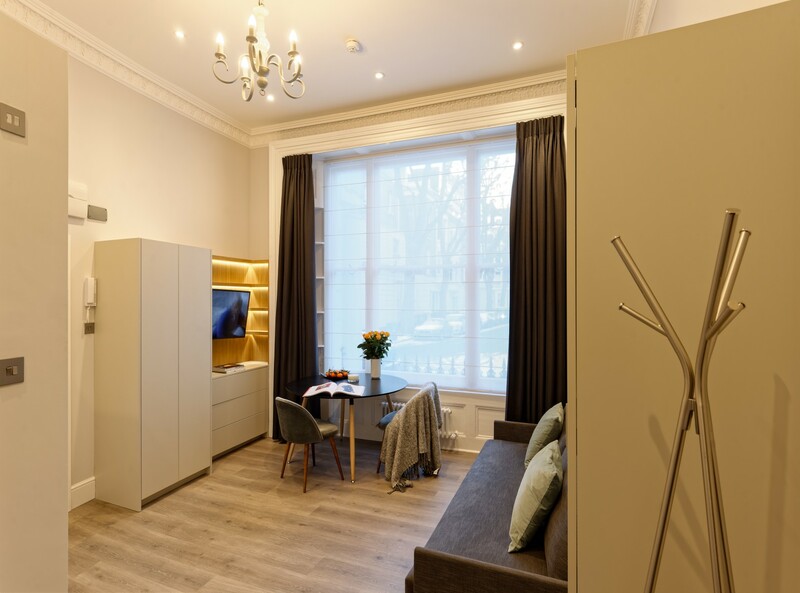 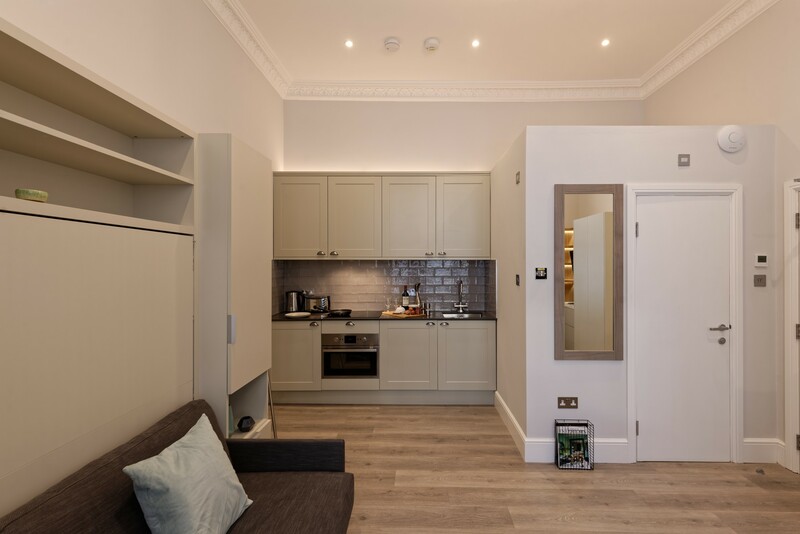 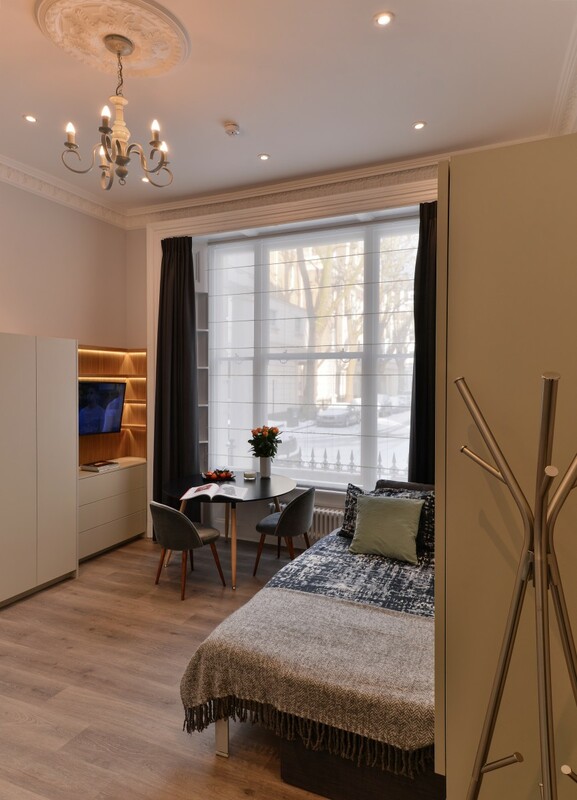 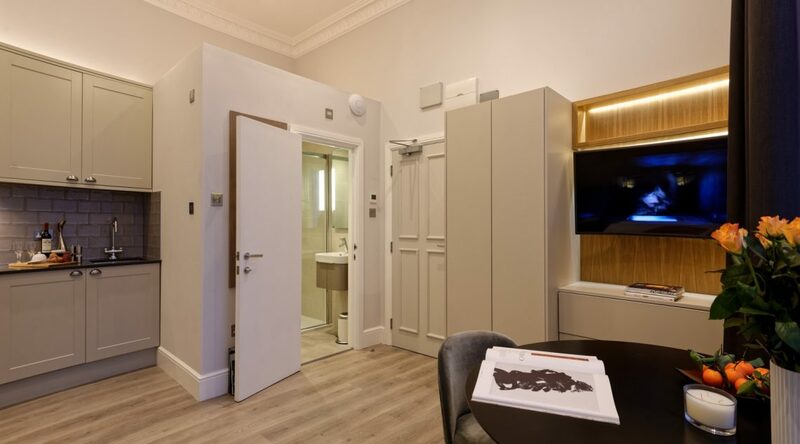 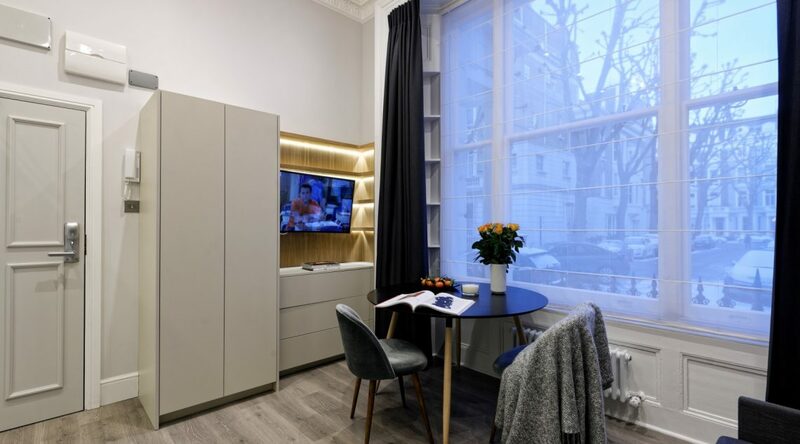 Apartment LG25-1 - Notting Hill Apartments Ltd. 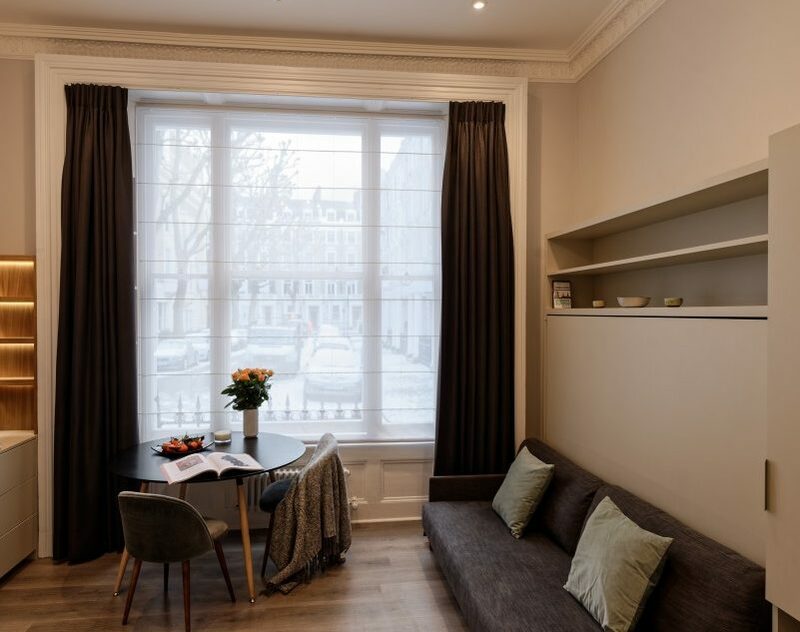 This bright and spacious ground floor apartment is in a grand Victorian townhouse on a quiet tree lined street in the world famous Notting Hill. 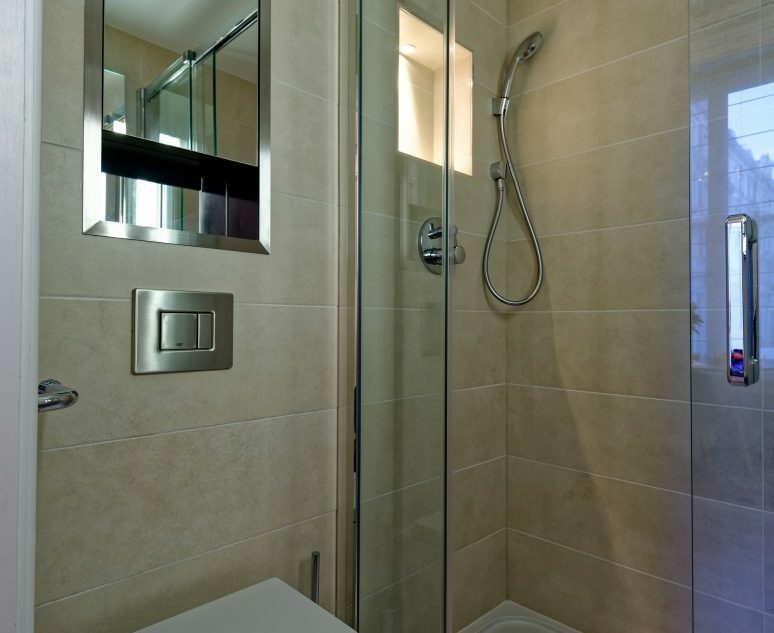 The apartment and building have been recently renovated to very high standards. 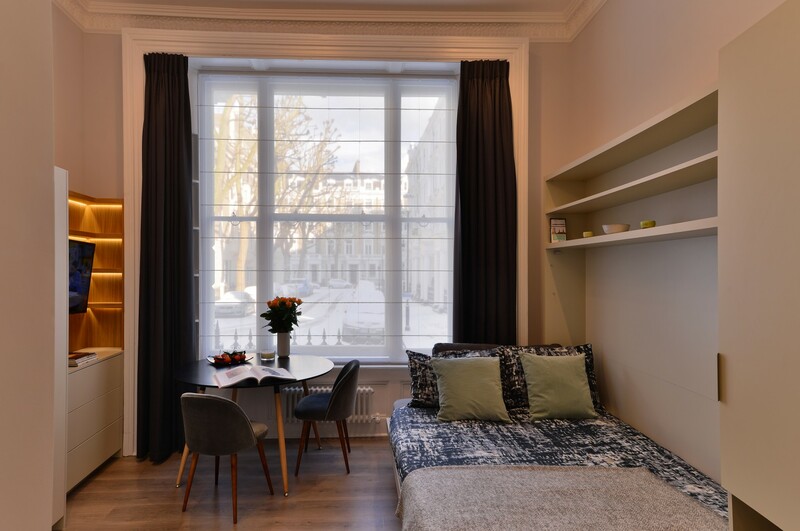 The flat offers stylish, interior designed living with excellent natural light from enormous windows and high ceilings. 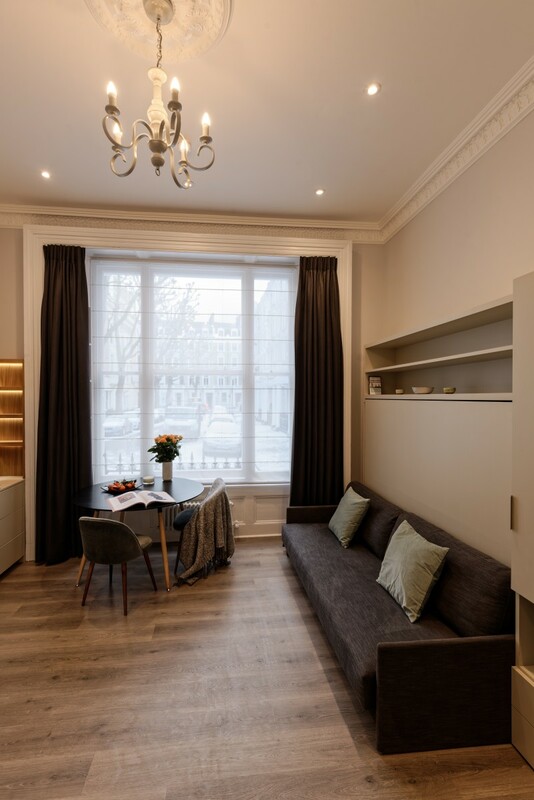 The understated interior is complemented by the wood flooring, original Victorian features and modern, custom built joinery which makes for a stylish and welcoming space to call home. 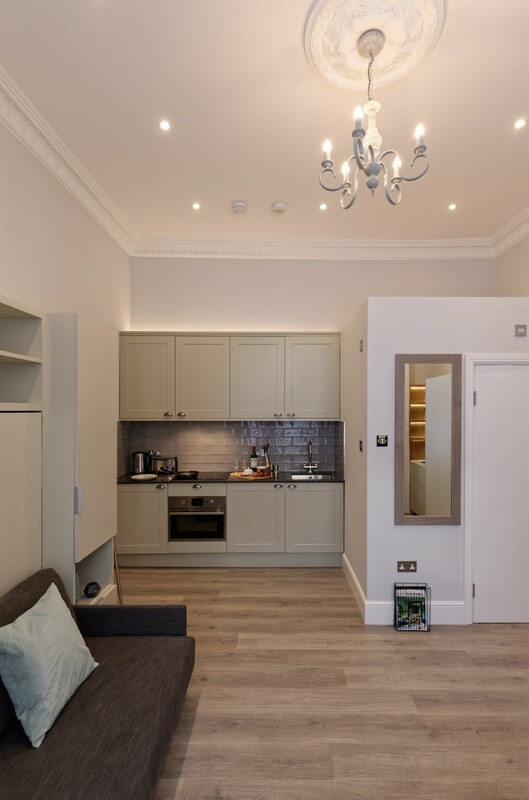 The large, open plan living area has views onto the street of grand Victorian houses below. 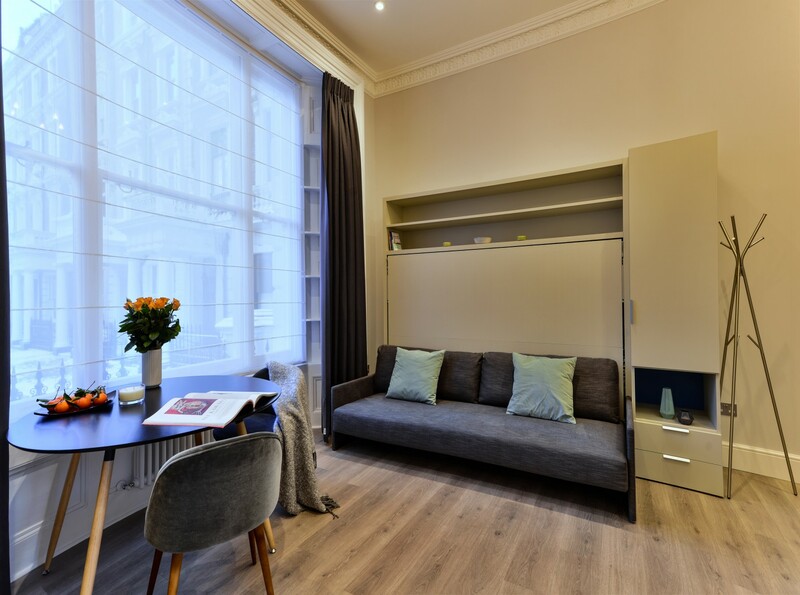 It has the innovative Clei bed system which provides a comfortable sofa and an easy to convert double bed for a great night’s sleep. 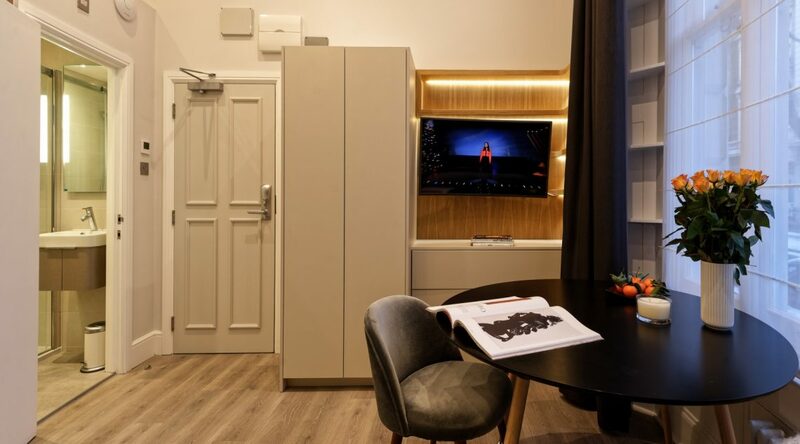 The large flat screen, smart TV invites lazy days or nights. 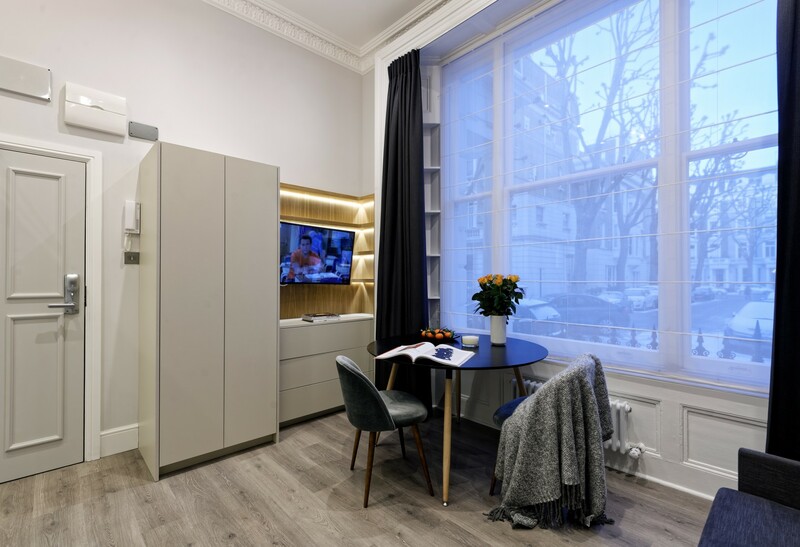 There is a small dining table and chairs which can double as workspace or dressing table. 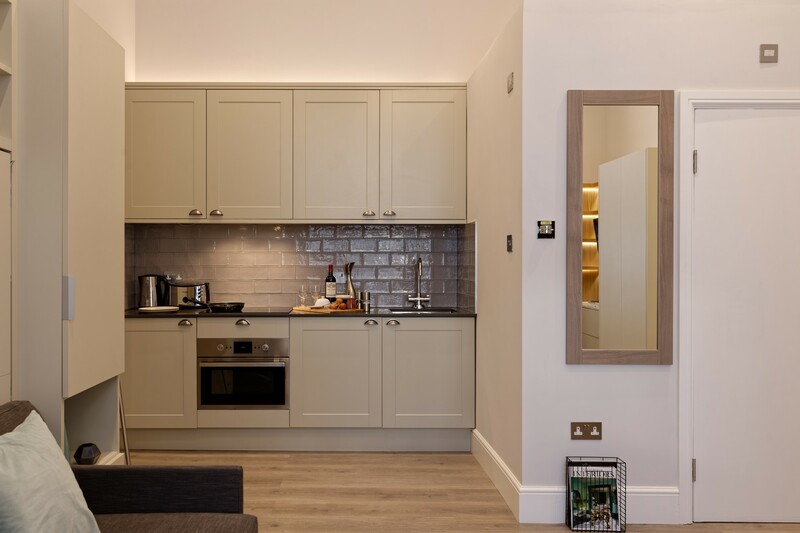 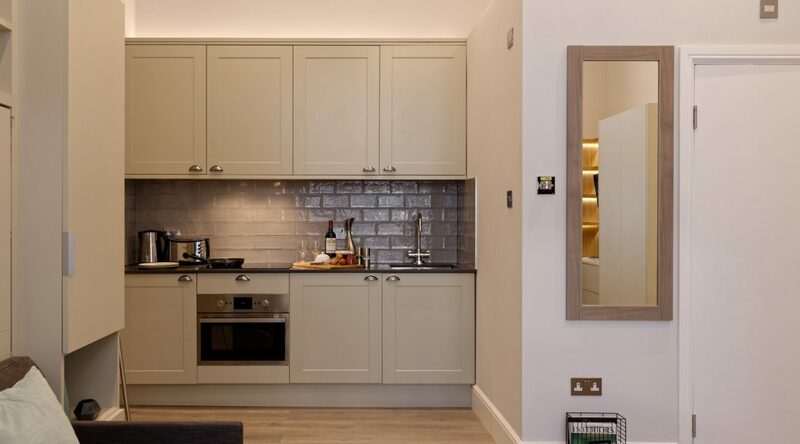 The newly appointed, custom made kitchen includes integrated fridge freezer, kettle, toaster, oven&hob and everything you need to practice your cooking skills, from pots and pans to cutlery and crockery. 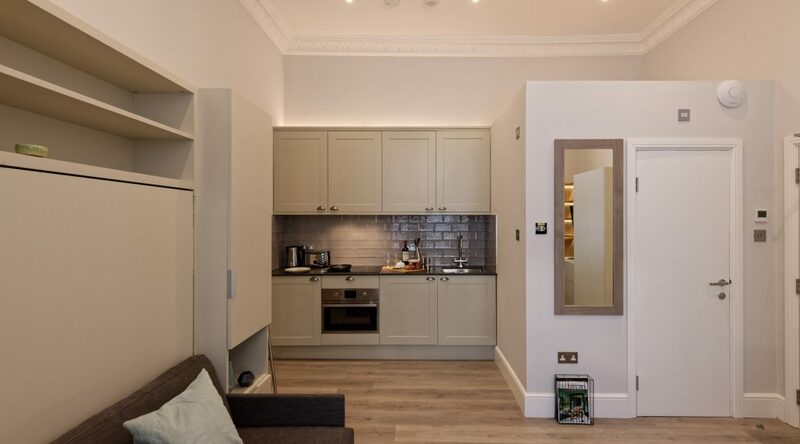 The apartment also has its own washer and dryer in addition to the separate, shared laundry room in the building. 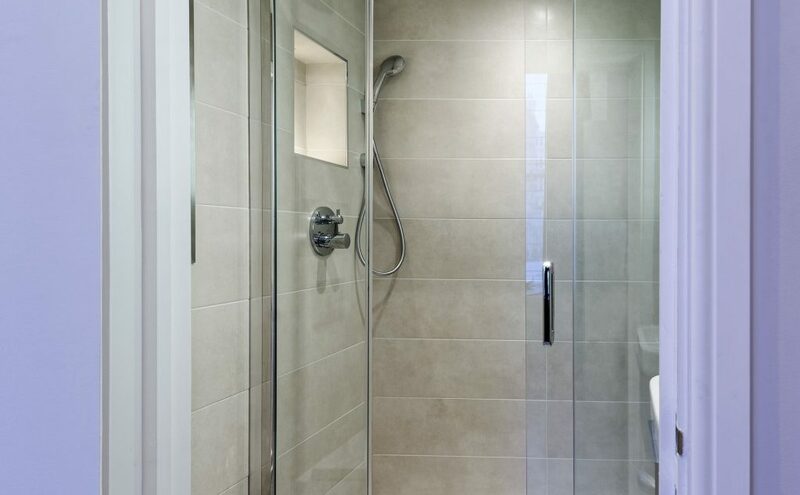 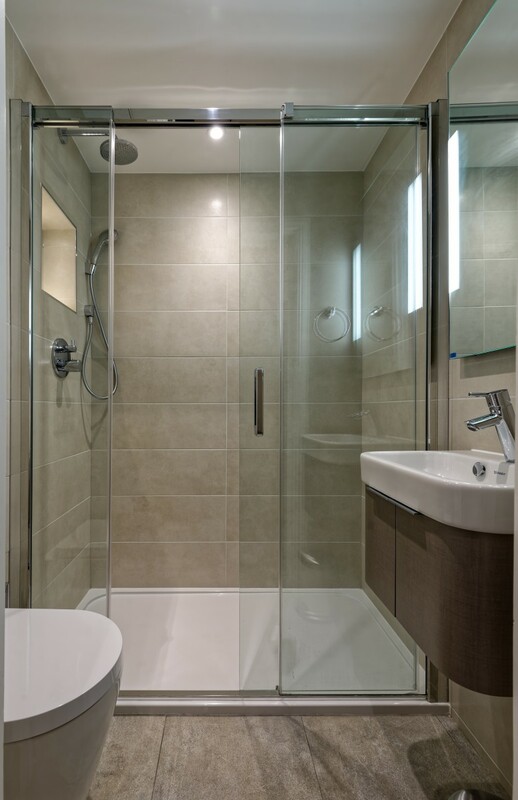 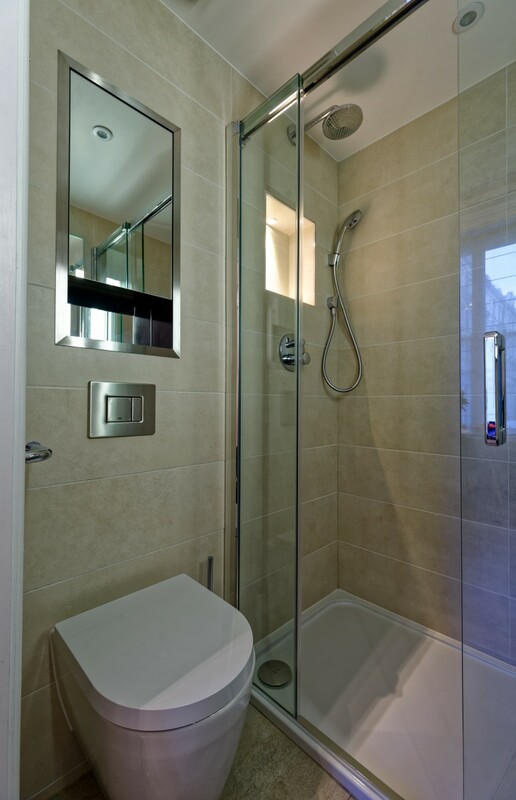 The bathroom is fully tiled and has a walk in power shower and body jets to start the day feeling refreshed. 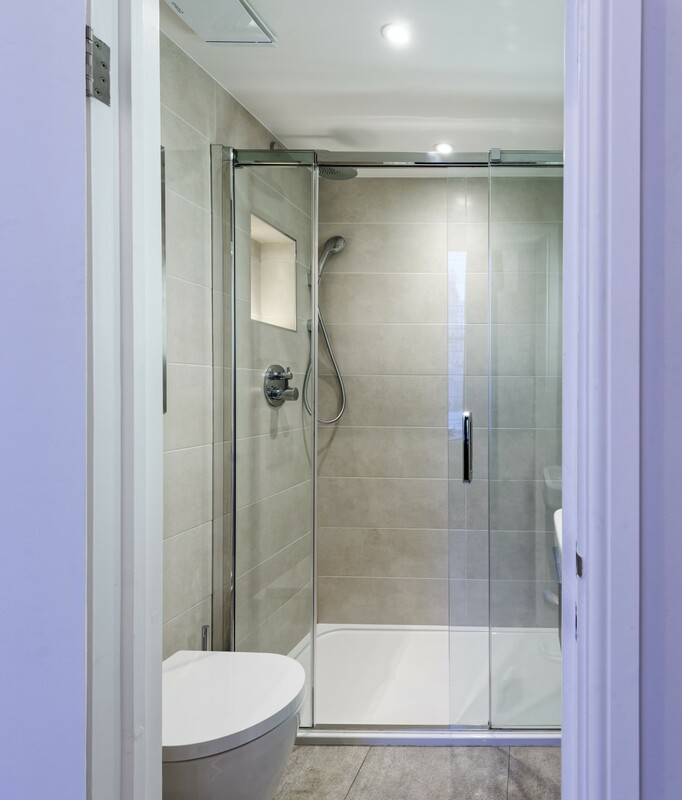 It also benefits from underfloor heating for those cool London winters. 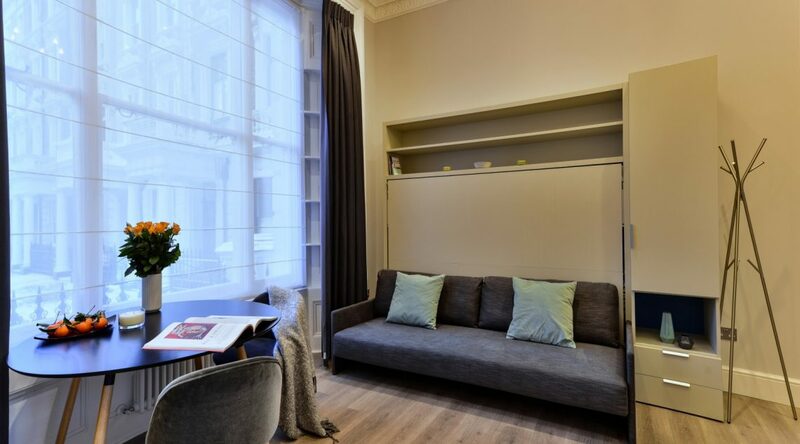 Included in your rental cost are all utility bills (electricity, gas and water), TV and free WiFi. 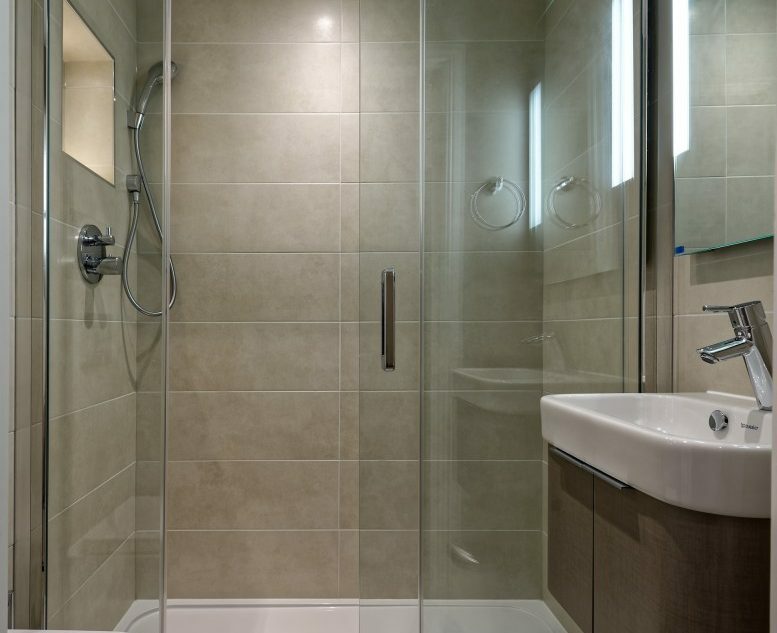 By separate agreement, we can also provide a weekly cleaning service should you wish. 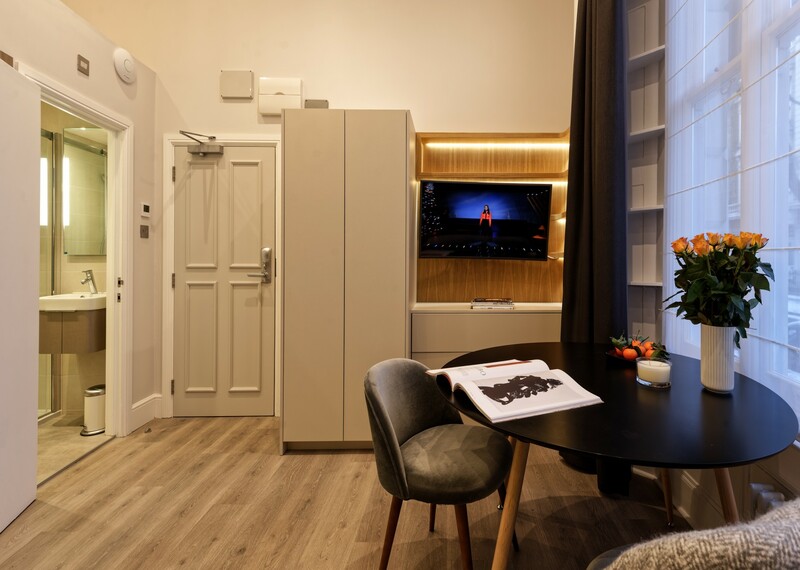 The building has CCTV security systems and you have an entryphone system in your flat. 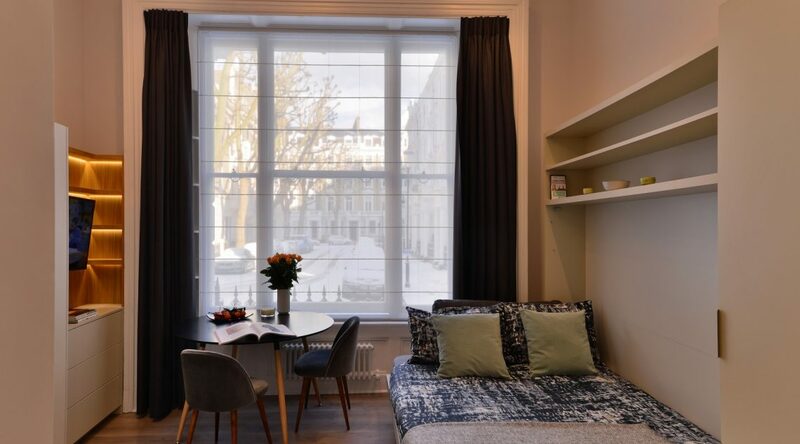 Notting Hill is a great neighbourhood of London to rent an apartment. 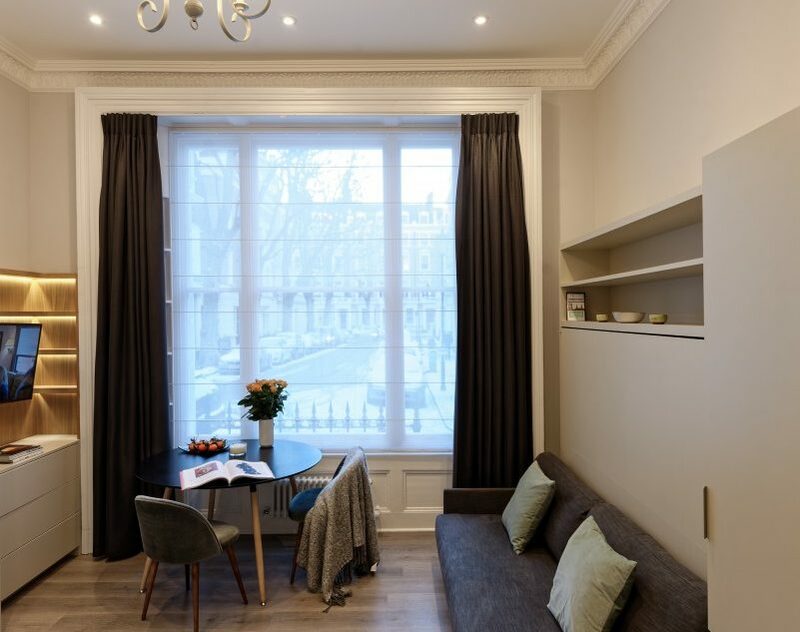 The area is famous for its appearance in the synonymous movie, its pretty streets and the weekly Portobello Road Market and has a charming community atmosphere.